The rapper was reportedly returning from a European tour. Daniel Hernandez a.k.a. 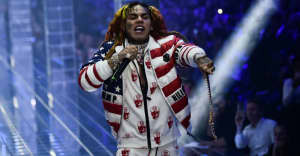 6ix9ine was arrested at New York City's JFK Airport on Wednesday, and is accused of choking a 16-year-old fan earlier this year in Houston, Pitchfork and TMZ report. According to county records viewed by Pitchfork, Hernandez had an open warrant for misdemeanor assault causing bodily injury. The charge stems from an incident in January 2018 at the Galeria Mall in Houston. The 16-year-fan alleges Hernandez grabbed him by the throat and choked him during an altercation. In 2015, Hernandez pled guilty to one felony count of use of a child in a sexual performance. In May, he was reportedly arrested for allegedly assaulting a police officer and driving with a suspended license.